One of the most telling signs that the bubble was ready to burst was that the media that sprang up to cover it went from non-existent to overwhelmed by advertising in less than a year. Publications like the Red Herring and Business 2.0 came out of nowhere and found themselves packed with glossy ads—mostly from startups that had run out of space for ping pong tables. Even the name of that second one, “Business 2.0,” was disgusting. The idea was that what used to be called just “business”—providing a product or service that people would pay for and doing what you could to control costs or raise prices, with the difference between your revenue and all your costs being the profit—was 1.0. The new way—barely any revenue, never any profits, and often not even evidence that people even wanted or needed your product—was superior. An entire ecosystem sprang up to support this new model and new and credulous media appeared to chronicle it. The heavyweight champ of these new magazines was The Industry Standard. 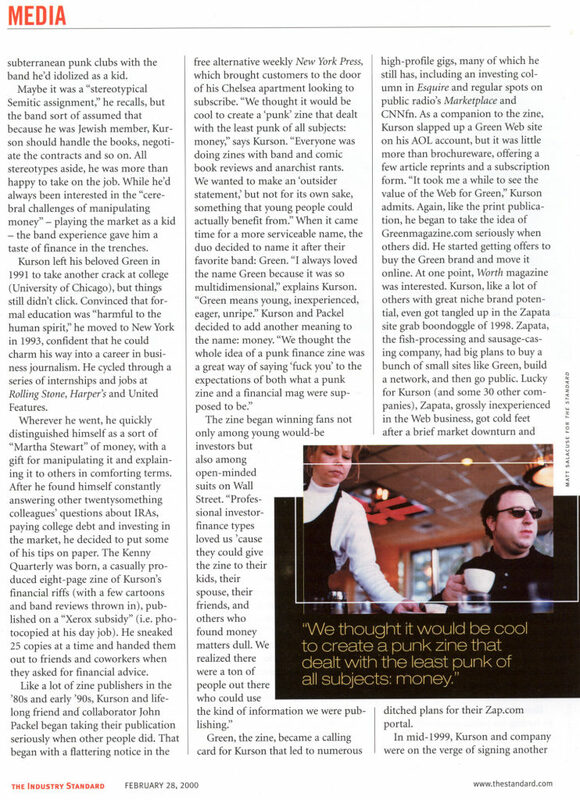 Conceived by Wired writer John Battelle, The Industry Standard launched in 1998 as part of tech publisher IDG and within two years was selling more ad pages than any magazine in America. By the time they covered Green in 2000, the thing looked like a phreakin’ phone book. 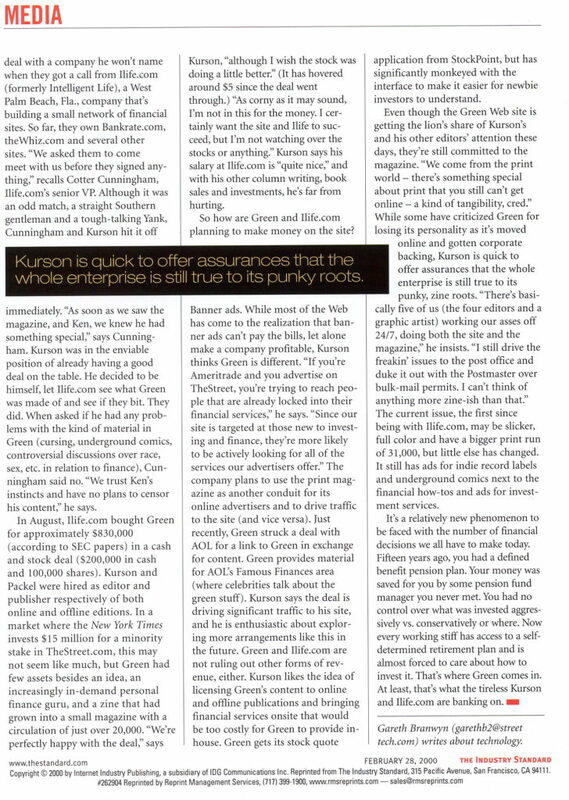 Anyway, during the salad days, The Industry Standard was so desperate for content to fill out the space between the ads that they ran a gigantic three-page feature on Green. Gareth Branwyn, one of the smartest and most down-to-earth writers in the tech space, had been a key writer for seminal tech pubs Mondo 2000 and Boing Boing. He captured the spirit of Green in the throes of its own 2.0 silliness, after Bankrate had acquired Green for a nice amount of dough and was busy professionalizing the operation. Special mention needs to be made of the photography. Matt Salacuse has shot everyone for everyone—covers include Robert De Niro for Businessweek, Andy Samberg for Time Out, Kings of Leon for NME, and a hundred more. 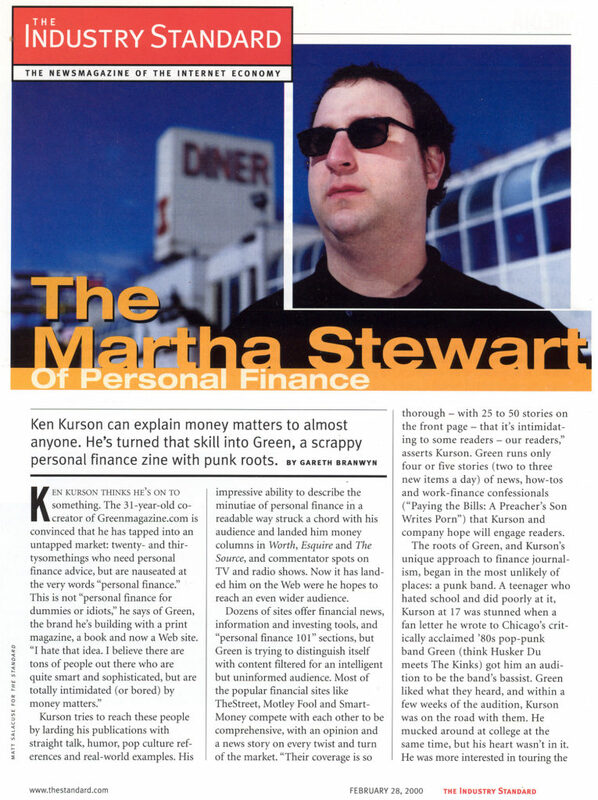 Ken Kurson for The Industry Standard was just a day’s work, but Salacuse loved the idea of imitating the iconic pose Tony Soprano struck outside the Clairmont Diner on Route 46 in Clifton. Sweaty and double-chinned, exactly as planned.